The Girls Network is a mentoring scheme in Year 11 where a number of girls have professional women mentor them throughout the year. Here Lydia, now in Year 12 describes, alongside her mentor Janet, the impact this has had on her life and career aspirations. Lydia  and Janet, her mentor, join us for coffee to talk about their mentoring journey with The Girls’ Network, what they’ve both gained and how they’re still in regular communication and supporting each other. The Girls’ Network launched in Liverpool in September 2017 with a group of 13 girls from Holly Lodge Girls’ College being part of the pilot in the region.The programme was kickstarted with a matching event, where the 13 girls who were on the programme met 13 professional women from different sectors while speed networking. By the end of the event, each of the girls was matched to a mentor best suited to her, with whom she would spend the next year developing new skills, planning for the future and growing her networks and confidence. 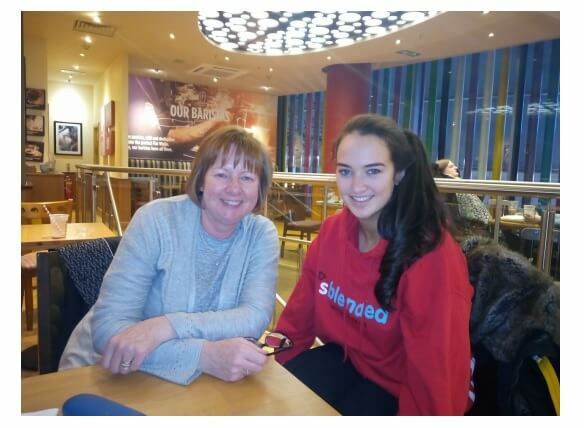 At the matching event, Janet, a Senior Engagement Lead at HMRC with over 30 years experience in the organisation, was matched to Lydia, a bright student who at the time of matching was in year 11, and had aspirations to go into education or business. We caught up over a cup of coffee six months after the programme was over, and we were delighted to hear that they still stay in touch regularly via email. Both were attracted to the programme for different reasons. For Janet, it was her colleague who encouraged her to apply to be a mentor. Whilst initially unsure, she now says how glad she is she joined the network, and is delighted she has been able to “pass on any advice or hints and tips” to her mentee. Lydia was encouraged to join The Girls’ Network by her school, and on reflection says that “it really was a great opportunity to have a mentor; you learn so much and it helps you through the year. I got work experience and everything from it”. Lydia’s successes are many. She is in sixth form studying A level Maths, Business Studies and Health and Social Care. She balances this with a part time job she started with encouragement from her mentor, where she was promoted to a supervisory role within 5 months from her start date, amidst being the youngest employee in the company. While Lydia was “shocked” by this, Janet proudly highlights “they obviously saw some leadership qualities in you”. Lydia’s goals are to own her own business one day, and find a job where she can be creative and innovative. She is now part of The Girls’ Network Ambassador Programme, which gives the girls who have been on the mentoring programme lifetime membership to The Girls’ Network. One of the long term goal is that our mentees decide to mentor once they are professionals and inspiring women in their field, something Lydia would consider doing because “I know how much Janet has helped me, so I would want to do the same for someone else”. As for Janet, following a really positive experience with Lydia, she has decided to start mentoring another girl, from the same school. And her advice for people considering becoming a mentor? “I would say go for it. You have got to push yourself, you can’t sit in your comfort zone for ever.